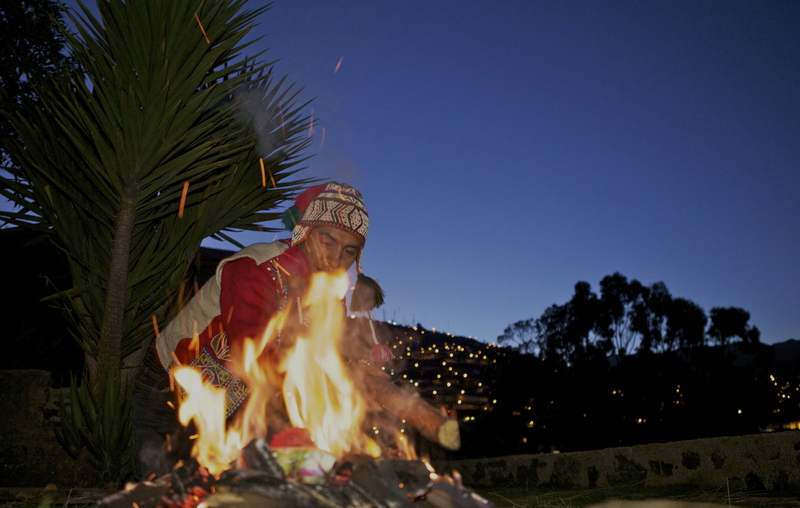 Shaman's Ceremony -- Cusco, Peru. During this offering by fire, I learned via phone that my June 17 oral biopsy was negative. Interesting coincidence. Monday, July 25, 2011. Lots of cancer doings this week, starting today with a full day at the Seattle Cancer Care Alliance. I’m writing this in the infusion waiting room on the fifth floor, soon to be summoned to resume hormone therapy (officially: androgen deprivation therapy). It’s my second round of ADT; the first time, I had one injection of Lupron every three months for a total of nine injections. This time, I’ll be on it for six months (two shots). Oh, and I’ll also be on Casodex, a chemo pill. I dread the side effects of ADT — hot flashes, fatigue, mood swings, and general chemo-brain. They worsen with time, the longer I go with no testosterone. But prostate cancer feeds on testosterone, and so ADT is a good systemic treatment. While it works. Eventually, some cancer cells become androgen independent and grow quite nicely without it. My Lupron injection is to be accompanied by an infusion of Zometa, a bone-strengthener to deal with my osteoporosis (another side effect of ADT). Cancer is so special: We get side effects that, for non-cancerians, are their own dreaded diseases. It’s been so long that I’d almost forgotten that good news is possible in the cancer experience: My PSA today is sideways. There’s this little mind game men play with their PSA tests: What will it be? How much higher will it go this time? A little? A lot? What’s the number I’d dread to hear? So this PSA test, I played the PSA head game yet again: Q: What’s the best number I can hope for? A: No change. Wednesday, July 27. Today was my maiden voyage to an oncologic naturopath, a huge step for me. I grew up knowing medical care as something that came from a pharmacy, a syringe or a scalpel. But I went to a Survivorship symposium at the Fred Hutchinson Cancer Research Center in June, and they had a break-out session on ‘complementary’ (nee alternative) medicine. I was impressed with the two oncologic naturopaths who presented, and now one of them, Dr. Laura James, is on my side. This step seemed fully consistent with my diet/nutrition efforts and no different than my looming “salvage” radiation (don’t you just love these terms they come up with? ): It’s one more weapon to wield, one additional thing I can do and have some control over. I now have four, naturally occurring compounds in my repertoire of daily therapies, thanks to Dr. James. We’re off to a great start. Thursday, July 28. Final cancer appt of the week (if you’re trying to keep track, the line score is: 1 infusion; 1 injection; 1 blood draw; 2 doc consults; and, today, 1 implant procedure). I now have three tiny Calypso beacon ‘seeds’ in my pelvis. These gizmos are part of my prep for radiation in the fall. Essentially what they’ll do is keep the radiation zapper on target. If my innards move, or I move, the Calypsos tell the zapper to move accordingly. That keeps the rad beam on target and thus reduces collateral damage to healthy tissue. Since I leave Sunday for three weeks in Sri Lanka, I’m thinking it’s going to be v-e-r-y interesting dealing with TSA when I march through the airport security scanner with these little Calypsos in me. Bill — i think that Shaman was on the job! Can you text him to keep him up-to-date on your activities? It might be worth getting him a phone…if he doesn’t have one. I think it’s great you are hooking up with a naturopathic doc. some of the medical treatments we come up with for cancer are necessarily toxic to more than the cancer & this is a good balance, i believe. You are so resourceful. I’m with Bob — i want a full report on the TSA. First all this TRAVEL. Now seeds… highly suspicious. Bill-as always you are taking this difficult process head on and marching forward with bravado. I admire your steadfastness and determination, and understand only too well the unknown we face. Have a terrific photo journey in Sri Lanka!!! Wow! Who knew it was all so complicated? Still, I admire your ability to keep it all in perspective and as I’ve said before am pulling for you all the way. Hope your travels are marvelous and that you’ll tell uys all about them when you return. (And I, too, am curious about the TSA — not just because of your “seeds” but the TSA in general). You’re the second person in two days to have been/are going to Sri Lanka. I’m definitely going to have to get ambitious and venture past Poulsbo soon. I am sure you loved Cusco at 11,000′. We didn’t get to see a Shaman with fire. Must have been wonderful. So glad that you have found another hand to help; oncologic naturopath. Have a wonderful trip with Becky.